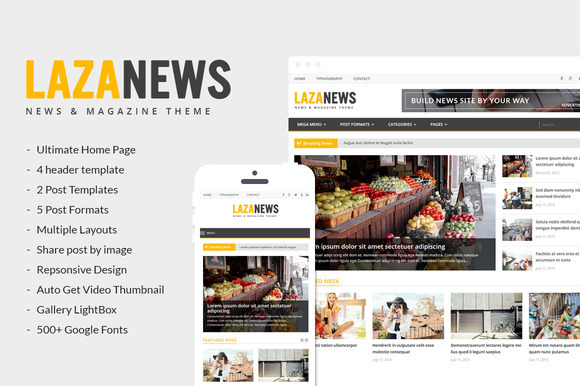 LazaNews V1.0 News, Magazine, Newspaper Wordpress Theme | BloggersStand ';-1!=b.indexOf("img.youtube.com")&&(a=' ');d=a+''+p+''+titlex+"
Free Download LazaNews V1.0 News, Magazine, Newspaper Wordpress Theme | LazaThemes theme is excellent for a news, newspaper, magazine or blog site, Theme builded with Visual Composer Plugin it easy to create unique and creative homepages by drag & drop. Multiple Layouts : Posts, Pages, and Categories can be configured to use a full-width layout or have a right sidebar (Custom Sidebars are supported). 1 Comments on "LazaNews V1.0 News, Magazine, Newspaper Wordpress Theme" So Far - Post Yours!